I have decided that the world is composed of two kinds of people-- those that are good at moving and those that are not. Unfortunately, I have also decided that I definitely fall into the latter category. Two weeks later and we are still not all the way out of the old house, nor are we settled in the new one. So, once again resorting to my favorite coping strategy- when the going gets tough, the tough find a corner and get reading. This week I have been reading this year's Newbery award winner, WHEN YOU REACH ME, by Rebecca Stead. This story doesn't read like a friendship or coming of age story. It's really more of a science fiction-y time travel mystery. Miranda's favorite book is Madeline L'Engle's WRINKLE IN TIME. She carries her worn copy with her wherever she goes and there are repeated references to WRINKLE sprinkled liberally throughout WHEN YOU REACH ME. Miranda's mother is studying to go on THE TWENTY THOUSAND DOLLAR PYRAMID, and there are also numerous references to that show throughout the book. Each chapter, in fact, is a "category" title, e.g. THINGS THAT HEAL. OK, so it's day #417 of the move (or maybe it's day #4 but it feels like day #417). And so, I assumed one of my all time most useful life mottos-- when the going gets tough, the tough find a bookstore and get reading. And that's exactly what I did today-- the boys had football at 4, I dropped them off and went and discovered-- MOCKINGBIRD. A TREASURE. Maybe the best novel I've read this year. Caitlin, a fifth grader who has Asperger's, sees the world a little differently than most of her peers. Her mother is dead and Caitlin has always relied on her older brother Devon to help her make sense of life, but then Devon is killed in a shooting at his middle school. And Caitlin must help her grief-stricken father to "bring closure" to the loss. I loved, loved, loved this book. Erskine does an amazing job capturing the voice and thinking of an Asperger's child (I kept thinking of Cynthia Lord's RULES, another book I really loved). 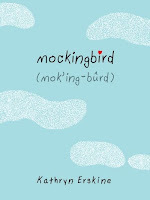 Next, it's chock full of references to one of my all time favorite novels, TO KILL A MOCKINGBIRD. Devon and Caitlin love the movie and have spent many hours watching it over and over again-- Devon even calls his little sister Scout. And I know the book would evoke some great discussions about compassion and kindness and respecting other people's differences. My boys are not avid readers, nor are they avid students. They like football, technology, their cell phones, video games, and girls; (the order depends on the day). Nevertheless, I will not give up. Every night, we have thirty minutes of family reading time (ok, I admit this moving thing has kind of thrown a wrench in the works). I buy way, way, way too many books and graphic novels and magazines hoping to find the one that will turn my guys into readers. I carefully position the newspaper, interesting photo up every morning, hoping that it will catch their attention. This week, I bought a book I think middle and high school teachers should know about. Karl Mecklenberg was a Denver Bronco for 12 years. He played with John Elway. He was defensive player of the week/year, all conference, and all pro. He has been married to his high school sweetheart for more than 25 years. He has remained active in Denver charities since his retirement. In the HEART OF A STUDENT ATHLETE, Mecklenberg identifies six qualities- teamwork, courage, honesty and forgiveness, dedication, desire and goal setting. Each chapter focuses on one of these traits. Mecklenberg shares lots of stories about his life on and off the field. He talks about game winning tackles, but he also talks about adversity- having to run a million hills for missing a makeup game in middle school, blowing out his knee after he made the starting lineup at the University of Minnesota, and being shot by a good friend on a hunting trip. HEART OF A STUDENT ATHLETE is a book my boys might read. It's about football. The voice sounds like lots of the coaches my boys have played for. There are lots of stories. It's broken into short sections that could be read in any order. There are color photographs. HEART OF A STUDENT ATHLETE is a book I would want in my classroom, if I was a middle or high school teacher. It's a book that guys like mine might actually pick up and read. We are, allegedly, moving this weekend. I love, love, love our new house. I love, love, love our new neighborhood. I can't wait to be settled. POETRY FRIDAY is hosted by Kelly Polark who has a lovely "Welcome Summer" poem. OK, so life is a little crazy in Carol's Corner right now. Closing at 9:00 this morning. We get the keys at 6 on Sunday night. My teenagers are being teenager-ish. One son has packed his room. that I was one of those people. of one of those hoarder show people. And wants to drive everywhere. And he's doing a great job. I am perusing the web. But those are always the hardest books for me to find. I read tons of great picture books. And lots of great YA stuff. to find great middle grade novels. 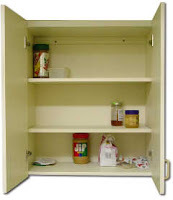 So I'm thrilled to find a new blog. after one of my all time favorite books. (Right now I would like to live in a museum. And you could find things. And there are probably boxes in the basement). Book reviews. Author interviews. Fun giveaways. Check it out. If you work with young children, you probably know Nancy Elizabeth Wallace, the author of SHELLS! SHELLS! SHELLS! and FLY, MONARCH, FLY! 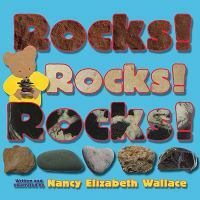 In Wallace's newest book, ROCKS! ROCKS! ROCKS! Buddy Bear visits the Rock Ridge Nature Center. He and his mom hike the Blue Diamond Nature Trail, where Buddy learns some basic geology facts and concepts, e.g. the earth is a ball of rock, rock erodes over time and that there are more than one hundred kinds of rocks. They also meet a park ranger who teaches them how sedimentary, igneous, and metamorphic rock are made. ROCKS! ROCKS! ROCKS! definitely rocks! The "facts wrapped in a story" format makes this fairly difficult topic easily accessible to young children. Diamond-shaped signs along the nature trail act as headings or subtitles and provide a great jumping off point for a discussion of how authors use different tools to support readers. Rectangular signs give kids with some fun facts to know and share. 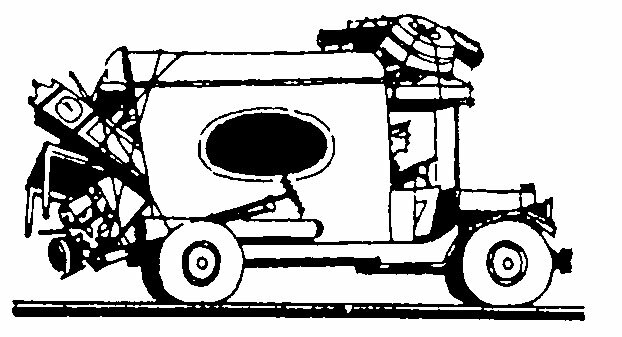 The illustrations are Wallace's trademark collage and include not only a variety of papers, but also some great photographs of rocks. Appendixes encourage young petrologists to start a rock collection, make rock magnets, write a rock joke, or build a cairn. Two other appendixes list rock places, e.g. Rocky Ford, Colorado, and rock sayings. Visit Nancy Elizabeth Wallace's website here. Between trying to get ready to move (not to mention several other life changes currently occurring), chauffeuring my sons all over Denver, and teaching son #1 to drive, I'm not feeling very eloquent (or coherent) these days. Found this quote, along with a gorgeous, gorgeous photograph on Cynthia Lord's blog yesterday (Lord's husband is a professional photographer and they live in Maine and almost every day she publishes a photo that I would love, love, love to own). a man’s (person's) reach should exceed his (her) grasp. So yesterday, I had one of those bad mother days. Get up. Wake children up. Drive 20 miles to summer school. Fight with son about going to summer school. Go to work for a couple of hours. Pick sons up at summer school. Drive home. Pack a couple of boxes for the move that is supposedly happening in about ten days. Wake up sons, who have spent 2 hours between summer school and football sleeping. Drive 20 miles back to town for football practice. Run errands, go for a walk, kill 3 more hours while the boys finish football. Find out son's phone has been stolen from his backpack at football. Fight with son about phone. Fight with son about life. Take other son to get hair rebraided. Get food for sons to eat in the car. Fight with both sons about life. I came home to one of my new favorite adult books- LIFT by Kelly Corrigan. LIFT is a book of Corrigan's essays about parenting. It's short. It's a quick read. And boy does she have some great stuff to say. The trick to pleasing the client, I figured out pretty fast, was cropping out every nick, scrape, and bruise, along with the pimply parts, the second chins, and any flash of impatience or disappointment in either parent's brow. It's embarassing how much we want to idealize family. Trust me when I say there's a lot you can figure out as you go. You don't have to be Qualified or Experienced. Nobody really knows what they're doing, except maybe gene splitters, and even they'd probably admit there's an unteachable art to everything. Real things? Things involving you guys (her daughters)? I don't think he can bear to consider them, so he lowers his emotional garage door and locks it from the inside. I came to know what a bold and dangerous thing parenthood is. Risk was not an event we'd survived, but a place we now lived. OUR ENDURING SPIRIT is excerpted from Barack Obama's inaugural address. Greg Roth's detailed pen and ink illustrations, highlighted with swatches of blue and orange and yellow and green, give kids the illustrations they need to make Obama's text, Drawings of an early railroad train cross, immigrants traveling to the United States, of slaves working the fields, armies in four different wars, an African American man eating at a lunch counter, and the Washington Monument provide kids with images to store in their mental timeline of American history. Aside from the beautiful images, I am fascinated by this book on several different levels. As I said earlier, I love, love, love the strength of Obama's words. 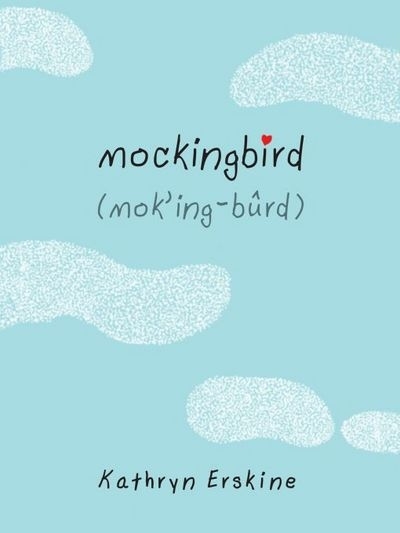 I can imagine myself reading this book again and again to our fourth and fifth graders, letting the words sink deep into their hearts, typing up the text so that they could read it for themselves, maybe even memorize it, so that they could recite it to their children and grandchildren. I'm also fascinated by the font choices in this book. On each page, interspersed throughout the text, a few words or phrases are set apart in a large, colored, cursive font. unity of purpose over confict and discord. Our journey has never been one of shortcuts or settling for less. who have carried us up the long rugged path towards prosperity and freedom. It doesn't really matter, but I wonder about those word choices. Who chose which words would be highlighted? Were they Obama's choices, so that he would know which words to emphasize? Or did Roth choose them as he illustrated? Was it a book designer? I'd love talking to kids about this, and about how they might use it as a tool for understanding or performing texts. I also loved reading the illustrator's notes in the back of this book. Roth talks about a time in his life when his art, as much as he loved it, had become work, and how he sought to turn it into play again. It was during this time that Obama was elected. 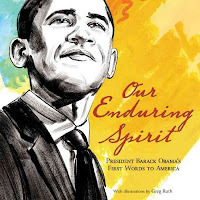 The day after the election, Roth went to his studio and turned out a series of pen and ink drawings of Obama, which then became the seed for this book. Roth also says several other things I want to remember and think more about, e.g., "Art is mostly about listening, really. The best art comes not when you're yelling outward with your medium but when you're quiet and listening to its source." A great new picture book for intermediate grades, as well as middle and high school English, history, or art teachers, and also speech or debate coaches.